They were prepared for war. They were prepared to die for their country. But Fort Carson soldiers say they weren't prepared to come home and fight a different battle -- addiction to illegal drugs. Many of this country's bravest men and women who volunteered to defend America in a time of war have come home wounded -- physically and mentally -- and are turning to illicit drugs as they adjust to normal life, according to soldiers, health experts and advocates. "Lots of soldiers coming back from Iraq have been using drugs," said Spc. William Swenson, who was deployed to Iraq from Fort Carson. "Right when we got back, there were people using cocaine in the barracks; there were people smoking marijuana at strip clubs; one guy started shooting up," he said. Fort Carson's leadership declined to discuss substance abuse issues with ABC News despite numerous interview requests. Fort Carson also said it could not comment on the individual cases of the soldiers we interviewed, citing privacy concerns. In interviews with ABC News at the Pentagon, however, the U.S. Army strongly denied there was an increase in drug abuse among soldiers deployed to Iraq. According to Dr. Ian McFarling, acting director of the Army Center for Substance Abuse Programs, less than one half of one percent of soldiers in Iraq have tested positive for illegal drugs. "That's a testament to the kind of leadership we have is that they believe that that's not the place that they should be doing drugs," said Dr. McFarling. But Dr. McFarling said that once soldiers return from Iraq, the positive rate for drug tests doubles to more than one percent. In addition, Dr. McFarling said five percent of soldiers back from Iraq seek help for substance abuse issues from clinical providers. The U.S. Army does offer treatment for soldiers dealing with drug abuse, and Fort Carson has a busy Army Substance Abuse Program. But some soldiers are forced off post because Fort Carson offers no inpatient services; others get treatment in the community to avoid the stigma associated with seeking help, soldiers and advocates said. Since the Iraq war started in 2003, Colorado Springs hospitals and counseling services have seen a dramatic increase in active duty soldiers seeking treatment for substance abuse. Penrose-St. Francis Health Services went from treating no active duty soldiers for substance abuse before the war to between 30 and 40 now, said Phillip Ballard, the hospital's inpatient psychiatrist. According to Ballard, "Now that we have larger numbers than the military facilities can treat…it falls upon the civilian community to treat those patients." Veterans' advocacy groups charge that the problem of substance abuse is much greater than the Army wants to publicly acknowledge, and it's growing. "I've met with veterans from coast to coast, and I will tell you that there is a catastrophe on the horizon," said Paul Sullivan, director of Veterans for Common Sense. Three thousand fifty-seven veterans of the Iraq and Afghanistan wars were potentially diagnosed with a drug dependency from fiscal year 2005 through March 2007, according to figures provided to ABC News from the Veterans Health Administration. From 2002 through 2004, only a total of 277 veterans were diagnosed with drug dependency, the numbers show. When Spc. Matthew McKane listens to questions, he tilts his head to one side. When he answers, his speech is plain and matter-of-fact. A boyish grin occasionally creeps across his doughy cheeks and plays at the edges of his mouth, like a kid who got caught sneaking a cookie. If only it were that simple. As a medic in Iraq, the 22-year-old McKane saw the ravages of war firsthand and found he couldn't deal with it. McKane said he turned to self-medication by using drugs to numb the senses, and he was not alone. Now McKane fears he will soon be discharged from the Army because of his drug use. Another medic, Spc. Jeffrey Smith, has already been kicked out for drug use and other misconduct charges and says he is dealing with his psychological trauma without medical or veterans' benefits. And yet another Army medic, Sgt. James Worster, is dead from a drug overdose in Iraq. Their stories are not unique. Many soldiers turn to drugs as a way to cope with psychological trauma from the war, according to advocates, health professionals and combat veterans. "I guess the stress just overpowers your decision making. You just [need] a little bit to get away from reality," McKane said. "You make stupid decisions." He arrived in Baghdad in June 2006 and a day later was working in the emergency room. Smith said to escape from the daily chaos and stress, if even for a short time, many soldiers working in the hospital began to abuse Ambien, Percocet and Prozac, as well as prescription painkillers available on the black market in Baghdad. But eventually even those drugs weren't enough for some. On Sept. 18, 2006, McKane said he and fellow medic Sgt. James Worster decided to use propofol, a powerful general anesthetic used to keep patients knocked out while on life support. "[It was] us just being stupid, and just trying...a different coping mechanism, dealing with stress," McKane said. "All I remember is we passed out. And I remember waking up like hours later and looking over at my friend, just to see, you know, just to talk to him about the whole thing. And I noticed he wasn't on his bed anymore, and he was on the floor laying on his back." Worster was dead from an overdose of propofol, McKane said. According to McKane, "All I remember is me standing up there after it happened…getting the glares from everybody in the hospital. I felt like I was never going to make it out of Iraq…I felt the only way to get out was to commit suicide." It was Worster's second tour in Iraq, his widow Brandy Worster, 26, said. In between his deployments, Brandy said her husband saw a psychologist two to three times a week and took an antidepressant medication. "He had a lot of problems from the first time [in Iraq] he never really got over," Brandy said. "[He] dealt with things from children that were our son's age to adults, whether it was Iraqis or other soldiers, probably seeing the worst he's ever seen." Brandy blamed her husband at first, she said, but eventually the blame turned to acceptance and a need to move on. She said she tries to "give good memories" to their son, Trevor, who will be four years old this fall. "I can understand why soldiers sometimes take something, so [they] don't have to think about it," she said. "They're having to deal with all of this and not have any ways to combat what they are seeing." As more U.S. service members return home from Iraq and Afghanistan after witnessing the horrors of war, more will turn to drugs and alcohol to cope. That's according to mental health experts who say there is a strong correlation between Post-Traumatic Stress Disorder, or PTSD, and substance abuse. 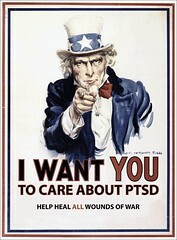 PTSD is an anxiety disorder that afflicts people who have been through a traumatic event. Dr. Phillip Ballard, a psychiatrist at Penrose-St. Francis Health Services in Colorado Springs, Colo., said he has seen a significant increase of soldiers from nearby Fort Carson seeking inpatient treatment for substance abuse. Between 30 and 50 percent of people with post-traumatic stress disorder will also abuse substances, according to Ballard. As many as half of all PTSD patients treated in the Veterans Health Administration also have a substance abuse problem, according to the Department of Veterans Affairs' own information. That is potentially a big concern since as many as one out of every four soldiers, or 28 percent, in combat brigade teams could be at risk for developing PTSD, according to a Department of Defense Task Force on Mental Health report from June 2007. Almost 40 percent of soldiers who have returned home report psychological symptoms, according to the report. Col. Elspeth Ritchie, the psychiatry consultant to the U.S. Army Surgeon General, acknowledged that post-traumatic stress is a risk factor for the abuse of drugs and alcohol, but said that the Army has not been able to quantify how strongly the two are linked. The Army maintains that there has been no increase in the rate of illegal drug use among soldiers since the beginning of the wars in Iraq and Afghanistan. ABC News was able to interview numerous U.S. service members who say they turned to drugs to help cope with their PTSD symptoms. Gamal Awad, a former major in the U.S. Marine Corps, said he smokes marijuana to help cope with PTSD. Awad was first diagnosed with PTSD by a Marine psychiatrist after the 2001 attack on the Pentagon during which he said he picked severed limbs out of the rubble. Despite the diagnosis and his ongoing treatment for PTSD, Awad was still deployed to Kuwait and Iraq, which he said made his condition much worse. "I was having suicidal thoughts...I would go out on convoys with the purpose to die. I just wanted to be hit by an IED or get shot. We'd get hit with, you know, mortar rounds or rockets, I wouldn't take cover. I would just stand there," said Awad. Awad said military doctors prescribed him a range of antidepressants and sleep medication, but he fell into a spiral of depression and misconduct that led to his discharge from the Marines. A civilian doctor then prescribed marijuana, which is legal in California for medicinal use, to treat Awad's PTSD symptoms. Col. Ritchie said she was unaware of cases of soldiers turning to drugs to cope with the trauma of their experiences in Iraq. "That has not been my experience," said Col. Ritchie. "My psychiatrists and social workers who see soldiers report to me of their experiences with soldiers all the time, and none of them are seeing that particular explanation." Col. Ritchie said in her experience, soldiers more commonly turn to drugs to recreate "the intensity, the adrenaline high" that they got during combat. Psychological trauma and drug use, however, are nothing new for combat veterans, said Steve Holsenbeck, a former psychiatrist at Fort Carson who served in the military from 1973 until 1993. Many of this nation's homeless are veterans of previous wars who are still grappling with psychological issues from their service, he added. "I suspect we'll see a lot of what we continue to see from Vietnam," Holsenbeck said. "I think it's going to look exactly like it looked then and like it looked after the Crimean war and after probably the battles between Spartans and Athenians. You're going to see people who are veterans, who came back; everything piled up on them; they got addicted to alcohol or drugs, lost their employment; they lost their families; they end up on the street." Follow links for each article to read them in full, and to access a variety of multimedia presentations that go along with each story. Be sure to watch 20/20 Friday night for more.